Your home will look boring compared to these that are currently on the market. They’ve got to make you wonder if your home needs a little more character! Who knows, maybe you’ll get some good ideas for your home. But really, just for fun, here’s a peek into the listings for some of the unique homes that are currently on the market. This home was built around stone walls that have ancient petroglyphs on them, making it part of the National Register of Historic Places. In fact, it was really built by pouring concrete among the bounders—they make up 60% of the home’s structure. It sits on nine acres of desert, and it comes with an ancient Native American fireplace and gorgeous mountain views. The home also includes modern conveniences like double ovens, an extra-large refrigerator, and a deep tub with shower in the master suite. See the listing for the home here. Have you ever wanted to live in a castle? There’s one for sale just outside Fayetteville, Arkansas, on the edge of the Ozark National Forest. It even comes with a 70-foot steel and wood plank bridge. The property also comes with a gazebo made out of stone and wood and four decks that surround the home. There is also a natural waterfall and plenty of garden space. Listed at just $295,000, this is by far the most reasonably priced home mentioned in this article. Check out the listing here. Do you want to channel your inner Fred Flinstone? “The Flinstone House,” as it has been affectionately dubbed by local residents, is between San Francisco and Silicon Valley. Its unique orange and purple domes house irregular, rounded doorways (which are made of sprayed concrete). The kitchen has cubby holes made out of the same sprayed concrete, along with a futuristic-looking refrigerator door and curved countertops. See the listing here. 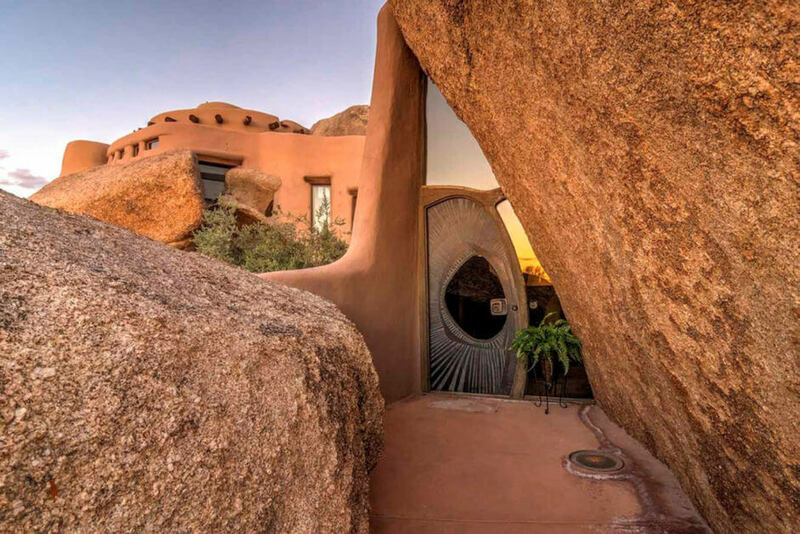 Jim Milstein built an asterisk-shaped home that is mostly underground and made of concrete. It retains heat exceptionally well (even in cold Colorado) and is very energy efficient. A sandstone tower rises above the six spokes on the ground. The six spokes are a living room, a study, a kitchen, a garage (and the front door), and two bedrooms. The massive roof deck has gorgeous, unobstructed views of the Rocky Mountains. Check out the listing for the home here. This glass house was inspired by two iconic homes—Miles van der Rohe’s The Farnsworth House near Plano, IL, and Philip Johnson’s The Glass House in New Canaan, CT. This unique architectural statement was designed by Michael Bell as his “essay in transparency,” according to the listing. Indeed, this single-level home appears to dissolve into the secluded land around it (nearly 13 acres worth are included with the home). The home also includes top-of-the-line appliances. See the listing here.